MICHAELs REISE is the 2nd Act of Stockhausen's dramatic music work DONNERSTAG AUS LICHT (THURSDAY FROM LIGHT), which was the 1st-composed entry of his 7-part, 29-hour opera cycle LICHT (Light). LICHT is a work for acoustic and electronic operatic forces, divided into the 7 days of the week (one opera for each day). This opera cycle revolves around 3 archetype characters, MICHAEL, EVE and LUCIFER, and over the 29 hours each of these characters are introduced, come into conflict, face temptation and finally come into union. The music is almost entirely based on a "super-formula", which is a 3-layered melodic-thematic representation of the 3 characters. These formula-themes are together and separately threaded throughout the opera's vocal and instrumental fabric. Story-wise, actors and narrative can (and often do) change from act to act and the libretto text is sometimes made up of non-traditional grammar or even purely phonetic sounds. DONNERSTAG (Thursday) is about MICHAEL's experience as a human being on Earth, and the celebration of his return to "Heaven". Act 2, MICHAELs REISE UM DIE ERDE (MICHAEL's Journey Round the Earth) depicts MICHAEL solely by a trumpet theme, and this theme "visits" various cities on Earth and interacts with their individual characters/textures. While traveling to the 7th Station (Africa), a basset horn (representing EVE) is heard, at which point the trumpet pursues the basset horn in a seductive dialogue. Eventually the pair fly off into the distance in harmony. The "Journey round the Earth" takes place purely musically. MICHAEL's instrument is the trumpet. The orchestra is "the world". Musicians, as penguins, are seated around the globe at the South Pole. MICHAEL appears as trumpeter, dressed in blue and with the "Michael sign". He plays his formula as farewell, and climbs into the globe, which begins to rotate eastwards. At each of the 7 Stations which follow, a different window (balcony) opens, out of which MICHAEL leans and "converses" with the musicians. Two clarinettists - a clown-esque cross between swallow and penguin - whizz through the orchestra several times while playing. At the 6th Station, MICHAEL hears a basset-horn in the distance and gives a sign to turn back. The Earth starts rotating backwards. At the end of the 7th Station, on hearing the basset-horn again, he stops the Earth, climbs out, calls in vain for an answer, and is consoled by the double-bass. Again the call sounds and comes nearer. EVE appears as a beautiful, seductive basset-horn player. She plays with him, enchants him, and finally, dancingly, takes him away with her. During this, two clowns with clarinet and basset-horn slink in, mock the couple, climb into the globe, play on a balcony, are attacked by the trombones and engaged in a fierce argument. The long held notes of MICHAEL and EVE can be heard in the distance. Finally they approach and end in a loud, lamenting, falling melody which fills the entire space while the light slowly fades out and all becomes still. In the darkness the melodies of the trumpet and the basset-horn calmly fly in the sky, accompanied by increasingly sparse droplets of sound from the orchestra. Both unite in an artfully intricate trill, which very gradually slows down. The below table gives broad descriptions of the musical events which occur in this Act. A more detailed musical analysis follows farther down the page. Eingang Aggressive brass stabs lead into in three "siren signals". Abschied (Michaels Formel) Solo trumpet plays the Michael formula. A brass motif signals arrival . (Cologne, Germany) Solo wind, brass and strings dialogue over suspended strings and harp harmonics. A brass motif signals departure and arrival . (New York) Boisterous brass supported by tom-toms and cymbal, joined by a "mischievous" clarinet duo. (Japan) Foreground instruments backed by "temple" music (featuring gongs and other percussion) lead to ritualistic, suspended harmonies. ending in expressive string bowing and glassy ostinati. (India) Low strings and brass dialogue on formula figures supported by falling harp glissandi and suspended high strings, ending with the beginning of the Michael formula. (Jerusalem) Formula figures led by trumpet are separated by percussive, whispery and mocking textures on strings and winds. HALT After a trumpet fanfare, the ensemble is quieted by the reappearance of the basset-horn, with which the trumpet attempts to engage in dialogue. However, the basset-horn soon departs once again, leaving the trumpet to a solo sequence. The forsaken trumpet is eventually "consoled" by a plucked contrabass (the orchestra plays sustained harmonies). MISSION The basset-horn reappears yet again and playfully dialogues with the trumpet (using formula motifs). A pair of clarinets enter and "mock" the couple. Trumpet and basset-horn recede into the distance. Verspottung The clarinets continue in a satirical, sardonic mockery of the now distant trumpet/basset-horn couple. Kreuzigung Low brass forces engage the mischievous clarinet duo in a stern dialogue, ending in accent chords and falling figure. Himmelfahrt The trumpet/basset-horn couple returns, as the other orchestral forces slowly disperse into pointillistic accents (and bowed metal percussion). The sounds of the trumpet and basset-horn are panned around and eventually end up in an unwinding trill (embellished by the bowed metals). There is no dialogue or singing in this Act at all, since all of the emotional interactions are represented by the melodic formulas of the LICHT super-formula. The MICHAEL, EVE and LUCIFER formulas include melodies as well as gestural elements which could fall under the category of "extended technique", such as dynamic modulation, harmonics, vocalizing, tongue clicks, etc... Sometimes these melody formulas occur in a very simplified form without any extra-melodic gestural elements and are called "nuclear formulas". "Head motifs" are leitmotifs taken from the beginnings of the formulas. 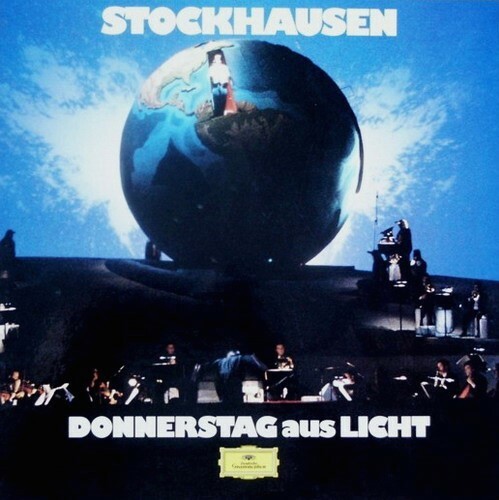 In any case, MICHAEL's Journey is probably one of the best places to start when beginning to explore the theme elements of Stockhausen's 29-hour long LICHT composition, especially since it lays out the 3 formula themes in a relatively straightforward manner. In the other 6 operas of LICHT, these formulas will undergo some very dramatic manipulations, so having the basic statements in mind could make the later works more "familiar", at least maybe in some subconscious level. In order to fully understand the LICHT super-formula and follow this colorful and dramatic trumpet concerto, I recommend reading my "Brief Guide to LICHT Pt 2: Super-Formula" first, since that provides a much more expanded explanation of the Stockhausen super-formula technique. Below are the 3 formulas assigned to MICHAEL, EVE and LUCIFER, which act as the "themes" from which MICHAEL'S REISE is constructed, followed by the "Nuclear formulas", which are simplified versions of the formulas (and also frequently used). Click to enlarge. The 3 LICHT Nuclear formulas. Each is divided into 5, 7 and 6 "limbs" (fragments used as motifs). In the guide below the main formulas are identified in blue, red and green. Sometimes the formulas are in their "nuclear form" (simplified) and sometimes only fragments of the formula are quoted. In cases where it simply states that a formula is being played, most times the formula is actually altered, but in a very minor way. In the "Formulas and Forces" column, background orchestral activity (typically creating a Station's texture) is in italics. The CD timings in the 3rd column are from the Soloists' Version of MICHAEL'S REISE on the 1992 ECM recording, recorded 1989 with Markus Stockhausen (Tpt) and Suzanne Stephens (B.H.) with Ian Stuart, Lesley Schatzberger, Michael Svoboda, Kathinka Pasveer, Andreas Boettger, Isao Nakamura, Michael Obst, and Simon Stockhausen. The time durations in the last column are for the tracks on Stockhausen Edition CD 30, with Markus Stockhausen (Tpt) and Suzanne Stephens (B.H.) with the Ensemble Intercontemporain at IRCAM in 1980. 0:13: Trumpets & Trombones duel using fragments from their respective MICHAEL and LUCIFER formulas. 0:58: Horns, gong and tuba play 3 signals (long held C pitches). "He plays his formula as farewell..."
2:31: Solo trumpet plays the MICHAEL formula solo starting on C.
4:18: Orchestra plays a thick chord, as tuba plays 2 descending notes (ship's horn "departure signal"). Then another chord with more descending tuba notes signals arrival at next section. 6:20: 2 ascending chords signal the next section. "At each of the 7 Stations...a different window opens, out of which MICHAEL leans and "converses" with the musicians." High violins and harp harmonics provide a glassy background texture (as "new music"). 6:27: Trumpet quietly plays a low register version of the MICHAEL nuclear formula (some notes elaborated), flutes (supported by viola) play a low EVE formula. 8:04: BRIDGE: When the tuba plays the 1st LUCIFER limb (fragment), trumpet stops, and viola, cello and flutes dialogue with percussion (LUCIFER). 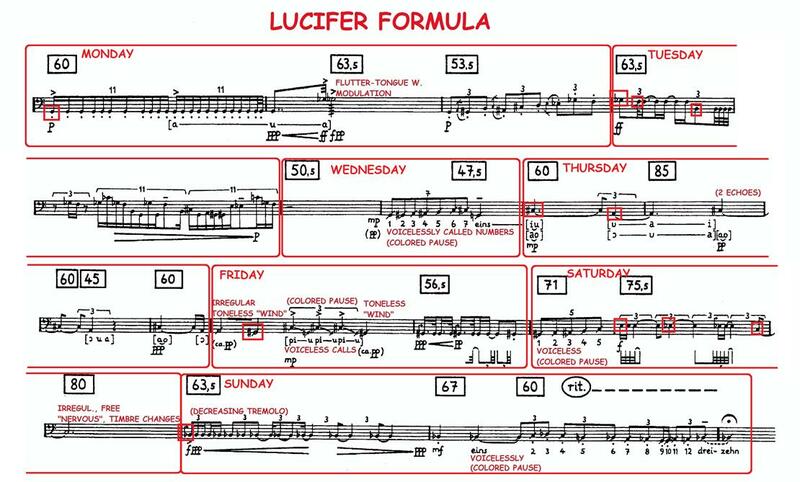 At the end, Trumpets play the MICHAEL formula head and trombones play the LUCIFER formula head. "Two clarinettists - a clown-esque cross between swallow and penguin - whizz through the orchestra several times while playing." Aggressive brass and percussion characterize this station. Tom-toms and cymbal provide percussive accents ("jazzy, brassy & percussive"). 8:43: Trumpets play the MICHAEL formula and trombones play the LUCIFER formula. 9:32: Tuba's LUCIFER head motif signals a repeat during which trumpets and trombones dialogue in mixed MICHAEL and LUCIFER formula fragments (sharing formula limbs). 9:50: A "clownesque" clarinet duo enters and synchronously plays fragments of the MICHAEL, EVE and LUCIFER formulas. 9:57: BRIDGE: Tuba signals with 2nd LUCIFER nuclear formula limb and trumpets/trombones begin slowing down their battle. At the end, Trumpets play the MICHAEL formula head. Harmonium, harp, bongo, bells, and gongs provide background texture (temple instruments). 10:59: This section signaled by a loud harp glissando and the 1st part of MICHAEL formula on trumpets. Clarinet duo departs. Trumpet plays a low LUCIFER formula, violas play the EVE formula and low winds play the MICHAEL formula. 12:26: BRIDGE: Tuba signals with the 3rd limb of the LUCIFER formula, followed by slow, subdued rhythms of the 3 nuclear formulas played at constant pitches (Bb, E, C#) (3 times). Ring modulated piano, vibraphone, gongs and congas play ostinato patterns to create the background "gamelon" texture, interspersed with moments of stillness. 13:56: Trumpets and horns play a soloistic variation of the MICHAEL formula. The clarinet duo returns and adds intermittent commentary. 16:57: The trumpet reaches a climax and withdraws, followed by a viola solo (or clarinet), playing loud exaggerated bow strokes, over a slow ritard of the orchestra. 17:51: BRIDGE: 7 descending notes from the MICHAEL formula (4th section) signal the next station. Repeating harp falling glissandi and "hissing, whispering" tones from the other winds create the background timbre. 18:06: Trumpet plays staccato fragments of MICHAEL formula, with swooping and diving gliss figures, while cellos and double basses play the LUCIFER formula and viola, flute and bass clarinet play the EVE formula. 19:46: BRIDGE: Trumpet withdraws. Cellos and dbl basses play the LUCIFER nuclear formula, as viola, flute and bass clarinet play the EVE nuclear formula ("hymn-like combination"). 20:12: The MICHAEL head motif signals the next station. "MICHAEL hears a basset-horn in the distance and gives a sign to turn back." Tom toms, gongs, chains, and orchestral trills and tremolos characterize the background timbre (tribal drum music). 23:25: TURNING BACK / UMKEHR: A distant basset horn plays the head of the EVE nuclear formula. The trumpet replies with the MICHAEL head-motif. Then the basset horn withdraws. Orchestra plays supportive chordal phrases, broken by rests with "colored silences" characterized by bow strikes and toneless blowing (texture is ceremonious, hymn-like). (the orchestra chord phrases are created from strings and winds playing the MICHAEL formula pitches in EVE formula rhythms, and brass homophonically playing EVE/MICHAEL pitches in the MICHAEL formula rhythms). 24:07: The trumpet plays a combination of the MICHAEL and EVE formulas (calling out to the basset horn). "...on hearing the basset-horn again, he stops the Earth, climbs out, calls in vain for an answer, and is consoled by the double-bass." 26:37: The basset horn briefly calls out with the beginning of the EVE formula, and the orchestra is halted with a trumpet glissando. After a pause to "listen", the trumpet replies with MICHAEL's formula (and also with fragments from the EVE formula), as the orchestra players very quietly "pass around" held pitches E and C#. 29:44: The trumpet and contrabass (pizz.) have a dialogue on MICHAEL's formula. "During this, two clowns with clarinet and basset-horn slink in..."
32:31: The basset horn returns playing the EVE formula, and the trumpet communicates using the MICHAEL formula. They "teach" each other during several permutated cycles of the MICHAEL and EVE formulas (eventually fading into the distance). 37:42: A clarinet and bass clarinet (or 2nd basset horn) duo begin synchronously interrupting with imitations. 38:22: The orchestra stops, leaving only organ. Trumpet and basset horn play formula nuclear notes in the distance, as the mischievous clarinet duo have a dialogue parodying the MICHAEL and EVE formulas. "...are attacked by the trombones and engaged in a fierce argument." 40:04: Low brass enters with a LUCIFER fragment and confronts the clarinet duo, increasing in intensity (as well as "nailing" down the distant trumpet and basset-horn), climaxing in 7 accent chords. 42:10: Trumpet and basset horn return and end the fight with 7 descending (lamenting) notes from the MICHAEL formula (for 7 stations). "...the melodies of the trumpet and the basset-horn calmly fly in the sky, accompanied by increasingly sparse droplets of sound from the orchestra..."
The orchestra plays quietly and pointillistically, slowly decelerating and spreading in pitch range. 42:42: The trumpet plays the EVE formula fragments and the basset horn plays MICHAEL formula fragments, revolving around each other. 44:51: Trumpet plays the EVE nuclear formula against a basset horn rhythm figure on a single note, followed by both rhythmically trilling and slowly joining together. The above guide is extrapolated from the listening guide Stockhausen provides in the score. The chart above can be summarized with color-coded lines below. The thick lines represent formulas, the thick crossed lines represent nuclear formulas, and the thin lines represent the clarinet duo. As can be seen, the first half is a battle between MICHAEL and LUCIFER across the globe, but when EVE appears, a different kind of "mission" occurs, one of teaching and learning. At the end, MICHAEL and EVE "ascend" (into the next Act of DONNERSTAG). The below table shows the same thing as the graphic above, but with the voices layered in the actual order (high to low). The asterix indicates a "soloistic" version of a formula. Thursday segment of the LICHT super-formula. 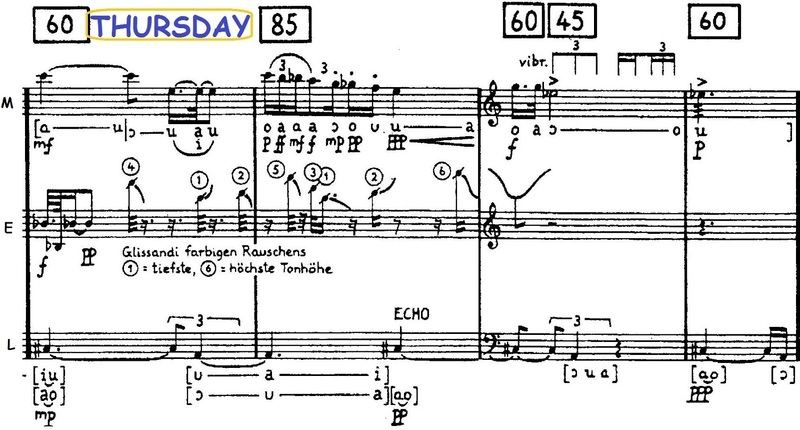 From a durational standpoint, in MICHAEL's REISE the 2nd measure in the figure above (Thursday limb-section of the LICHT super-formula) is stretched over the full duration of the scene and used to determine the formal structure. The descending 8-note phrase in this measure (top staff) represents the 7 STATIONS and HALT/MISSION subscenes of MICHAELs REISE UM DIE ERDE, and the two 8th notes following represent VERSPOTTUNG, KREUZIGUNG and HIMMELFAHRT. In his article "Time and LIGHT" (Contemporary Music Review 7, 1993) Jerome Kohl observes how the super-formula creates some of the longer, "drone" textures underlying the orchestration. The 3rd staff LUCIFER layer has an A followed by a C# in the 2nd measure above. This is expressed as long, held background notes on A starting from the 1st Station (sometimes changing instruments), and changing to the C# in HALT. In fact, there are multiple layers of the super-formula (and the LICHT nuclear formulas) stretched throughout the length of the 7 operas (as seen in my "subway map" graphic earlier), but this is just an example of the "slowest" layer. The faster surface layers are generally easier to hear and are described in the Listening Guide. Jerome Kohl's excellent article provides further examples of how Stockhausen folds his super-formula into the musical weave, including such techniques as speeding up some formula statements during their assigned sections, leaving space for silence, or solos. Below is a 2008 orchestral production of MICHAEL's REISE featuring Marco Blaauw on trumpet and Nicola Jürgenson on Basset-Horn, accompanied by MusikFabrik (directed by Peter Rundel), recorded in Cologne Germany. This version for solo trumpet of the Entrance and MICHAEL formula is fairly straightforward, omitting the 3 C chords at the end of Entrance. In this version for trumpet and contrabass duo, the trumpet plays a combination of parts from Station 7, followed by the call of EVE, the basset-horn part now played by the contrabass. The wind/brass drone tape is also sometimes employed here. After HALT is played, the duo moves immediately on to HIMMELFAHRT (Ascension), with the contrabass again taking on the basset-horn part. These are, like HALT, independently-performed versions of sections of MICHAEL's REISE... for smaller chamber ensembles, with some parts combined and some sections omitted. MISSION and ASCENSION also includes the trumpet and basset-horn parts for MOCKERY and CRUCIFIXION which is long whole notes based on the MICHAEL and EVE Nuclear tones. 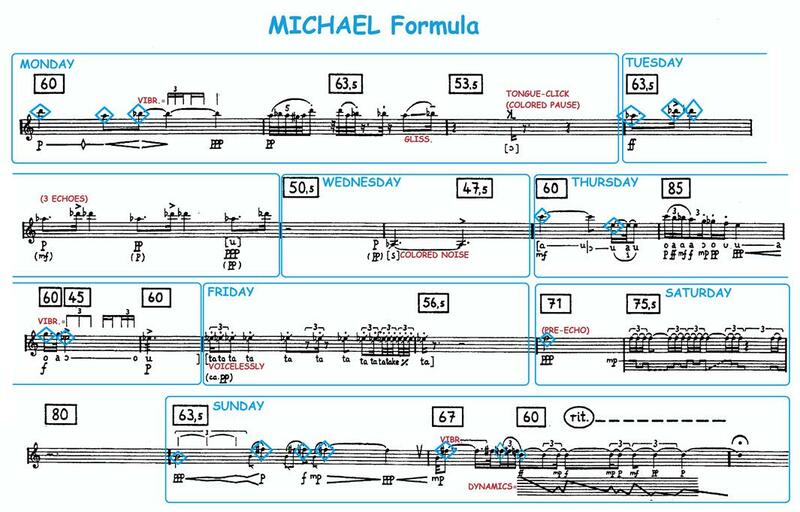 The first section presents the MICHAEL formula, highlighted by the trumpet section. The entire opera hinges on this melody, so it is appropriate that DONNERSTAG begins with a fanfare arrangement of it. This broad presentation also gives the audience a hint of the rhythmic, dynamic and timbral elements to come (including muted brass sequences and staggered dynamic accents). There is no piano or percussion in this section. Muted brass is joined by a rhythmic web of "exotic" tuned percussion (vibraphone) and piano. This section is based on Act 2's "Bali Station", and has elements of Balinese gamelan. In between bursts of brass, the tuned percussion textures seem to hang in suspended time. Eventually the brass parts join with the rhythmic pulse. A descending low brass line leads to a brief pause. The final sequence of the Greeting is based on Act 2's "Jerusalem Station", and is marked by ritualistic metal percussion interludes, as well as a brief "mocking" outburst and dissonant accents on the piano. Melodically, this section renders the 2nd half of the MICHAEL formula (continued from section 2). MICHAELs RUF (Michael's Call) is an arrangement of The MICHAEL formula (with some segments omitted) for 8 instruments or 4 trumpets. This was one of the first pieces from LICHT that I really enjoyed, since both Acts 1 and 3 of DONNERSTAG were too text-heavy for me to really "get" when I first heard them. It's too bad the video from the Milan performance is not available, I actually prefer the old school "papier mache and wires" aesthetic to all the digital screens people are using nowadays. At heart, MICHAELs REISE is a really fun trumpet concerto. 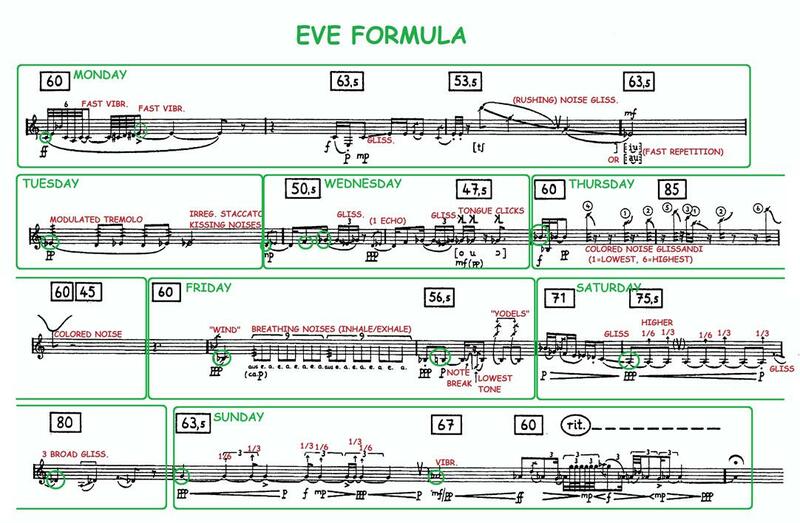 Though the initial structural idea of using the 3 formulas of MICHAEL, EVE and LUCIFER may seem a bit sterile and "formulaic" :) , the way Stockhausen orchestrates the whole thing and molds it into a very accessible music drama is extremely well done and effective. The trumpet and double bass duo is a nice highlight as well, probably another example of Stockhausen "breaking out" of his own structures.